North-west China meets south-east London at this friendly repository of noodles, stews and dumplings. A pioneer of London’s trend for branching out into regional Chinese cuisines, Silk Road quietly churns out favourites from the north-west frontier province of Xinjiang. Dishes can be fiery, but are also balanced with a plethora of spices, a legacy from the Silk Road that ran through the desert area, transporting treasures from east and west. The cuisine of Xinjiang’s Turkic Uighur Muslims, the area’s largest minority, exhibits many of the hearty traditional standbys found around Central Asia – notably kebabs and dumplings – but with a bold Chinese influence, bringing a spiciness and vibrancy its counterparts elsewhere can lack. Silk Road’s short menu includes Sichuan-style dishes – perhaps an influence of the ethnic Han owners – but skip past these dishes to focus on the Xinjiang specialities. Small, fatty pieces of lamb crusted with ground cumin, chilli and salt and grilled on a skewer are an example. Dumplings – filled with meat or vegetables – are typical northern China staples, although here lamb dominates instead of pork. It would be a shame not to try a few. What attracts most people to Silk Road is the noodle and stew menu. Our favourite was the ‘medium chicken’, a wonderfully rich star anise-and-chilli-flavoured broth bobbing with pieces of bird on the bone, plus potatoes. When you near the bottom of the serving bowl, and are approaching fullness, your waiter will bring a heaped pile of superb handmade noodles to dump into the aromatic broth and soak up the rest of the rich flavour. Salads of kelp or cucumber are a refreshing nod to any health initiatives you may have embarked upon. The small dining room is cheerful, if functional – and far more exotic than Camberwell Church Street. After reading rave reviews about this little neighbourhood Chinese, we made a booking (highly recommended) to go and explore their regional Chinese menu. Starting off with dumplings, while they are perfectly cooked, with paper-thin case, we found the inclusion of celery in dumplings a bit too strong for our taste. However, once the hand-pulled noodles hit the table, accompanied by pork and chicken stir-fry, it changed everything. The noodles were perfectly crafted, the chicken and pork had the welcome heat, plus washing it down with £2.50 Tsingtao beer was an absolute delight. Arguably my favourite thing about living in Camberwell is having this restaurant just a 5 minute walk from my flat. It's at capacity at almost every hour it's open which I'm presuming means that there are a lot of people who agree with me. You kind of can't go wrong with almost anything you order and you can afford to order liberally given how cheap everything is. The Big Plate Chicken is the main event here but you can get your hand-pulled noodle fix from a bunch of other dishes including the Xinjiang spicy lamb bowl which is delicious. The cumin-spiced lamb skewers are legendary and I'm a huge fan of the pan-fried dumplings too. The Home Style Aubergine is a delicious veggie option too - I'd always suggest coming here with at least one other to help you mop up the sharing-style platters that everything is served on. Wash it all down with a chilled TsingTao and now we are talking. It requires great strength not to visit this place at least once/week. A hidden gem in Camberwell. Silk Road provides you with dumplings for days, for just £3. The food here is really authentic Northern China cuisine, be aware, it's not the typical Cantonese-style dim sum you would get in Chinatown. The main carb here is noodles, which are freshly made and delicious. The food is incredible, and the portions are huge.The service isn't great, and the food isn't a feast for the eyes - it's just like being back in China! TERRIBLE! I got a food poisoning. When you pay a cheap price, be ready to suffer all night. I’ve taken my time visiting Silk Road; every time I tell someone I live in Camberwell they ask ‘have you been to Silk Road yet?’ On that note my expectations were naturally pretty high. Now, I thought it was good..not amazing.. This may have had something to do with the dishes we ordered, which were more spicy than I would have liked. The egg dumplings we ordered was also a tad bland but the lamb skewers and aubergine dish we had were amazing. It’s a relaxed setting, and constantly busy when I walk past which is a testimony in itself. Probably the best value for money in London! you should order the kelp, the cabbage, and the aubergines on top of the big chicken pot, dumplings and lamb shish. Just simply gorgeous mouth watering, soul tapping food. Best tasting food and best value for money in the whole of London. Shredded kelp, fresh steaming dumplings, lamb shish, double cooked pork... the list goes on. Silk worms for life! Best Chinese food in South London: Unique tastes, wondeful flavours, very cheap prices! Immense food from Xinjiang -far west china. Try the big plate chicken. If you go have the big-plate chicken! Consistent, delicious and authentic Chinese food. Go once and you'll keep on going back! The food is absolutely delicious and really good value. The chicken plates and smacked cucumber salad are a must. A brilliant example of real Chinese food. I could eat their lamb skewers all day, and at £1 each you really could. portions are huge. 'Middle Plate Chicken' could have fed a large family, so I can only assume 'Big Plate Chicken' will come in a bath tub. Seating is casual and we found ourselves squeezed on a table with little elbow room, but if it gets me in from the cold and seated quicker then it's fine by me. This isn't the place to choose for a long and leisurely meal. I don't find myself making the trek to Camberwell very often, but Silk Road makes every moment waiting for your bus to trudge through Elephant and Castle roundabout worthwhile. Almost. I have been there many times. Great food and service. I highly recommend it! Went to Silk Road this week and for the first time ever, managed to order the right amount of food! The tasty prices and amazing menu make it very difficult not to over order. This place is a classic 'locals favourite'... I love it. Extra spicy Chinese leaves taste even better than they sound and for those of a carnivorous persuasion, the double cooked pork is insanely good. Come in here for some truly delicious food. Thick home-made noodles, spicy bbq lamb skewers, and a big chicken soup dish are our favourites, and although everything on the menu is probably excellent, we can never resist getting the same. Service is swift and the basic canteen-style setting lets the food completely shine. Listen. Let's not mess. You're going here to eat some amazing food. It's not the kind of place you'd take to impress a prospective fancy man/woman. For one thing, the dining room is plain and utilitarian. It is there to facilitate you sitting down and eating. And what you will eat! You'll be eating unceremoniously. Jabbing your chopsticks around for tasty morsels of cumin and smoke-kissed lamb; red snapper that's had its skin crisped by intense heat and finished off with smoked paprika; and not to mention the cucumber smashed and generously dressed in chilli oil, vinegar and garlic. You won't be eating politely but when food is this good, it's every woman for herself. The best food in Camberwell! I go at least once a week and it's perfect every time. Very authentic restaurant. I recommend the lamb skewers a starter. Amazing, we try to go here on a regular basis as the food is so tasty and it's the unpretentious atmosphere that I can get on with in a restaurant. Homemade noodles worth a try! So so good! It's been a Camberwell institution for a long time, before the glossier additions to Church Street and the quality has never faltered in any of my many visits. The canteen style is super-no-frills but you wont notice as you'll be face down eating mountains of delicious food so quickly for fear your belly will catch up with you and make you stop. Portions are large and the prices are almost unbelieveably low. The chilli chicken dish is my old favorite but try something you've not heard of each time you go back (there will be more times) as it's never going to disappoint. On our most recent visit to Silk Road we were sad to see that the menu seems to have shrunk somewhat. But that really doesn't matter when everything on it is so damn delicious. We once ate there with a friend who spent three years in China and he said it was the most authentic food he'd eaten in London. 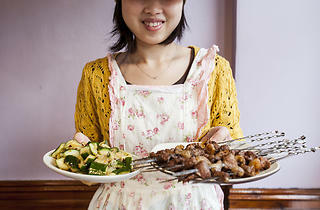 I'd have booked a flight to Xinjiang there and then if I hadn't been distracted by our second round of lamb skewers. By the way, you must order the aubergine. And the smacked cucumber. 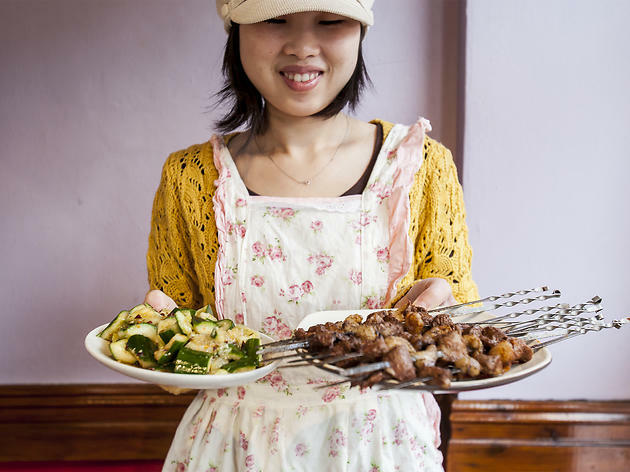 And as many lamb skewers as you can bring yourself to without feeling ashamed. It will still not be enough skewers. Love silk road, have been going for 4 years at least every 2 months and have never had a bad experience. Don't like typical chinese restaurants and love that there is nothing sweet but lots of spice and garlic used in their dishes. Their handpulled noodles and dumplings are to die for. You just have to know what to order. Their luxury noodle with a fried egg is without a doubt my fav on the menu. Yes it is kind of canteen style but that what authentic chinese is all about. Its my chinese heaven. I dream about silk road. Fantastic, authentic northern Chinese food - it's that simple! Excellent place. Staff are actually really friendly but not in the normal subservient way you get at most restaurants. Food is amazing and the people I have brought here come back themselves again and again. Timeout have got the rating wrong I'm afraid. Great atmosphere, easily accessible, fresh & affordable food are all the reasons why Silk Road is as busy as it is! Food is as spicy as it is tasty so expect a mouthwatering experience!!!! And the noodles - wow - they are awesomely long & very thick. Any discrepancies with the staff are due to culture differences as opposed to blatant rudenes...! Seriously fabulous food so grab a crowd & enjoy! Very accurate review by Time Out, pity the rating does not match it! Went there the other night and found the pace a true gem. It reminds me of a Trastevere trattoria, were good manners are not necessarily a good sign ;-) And the noodles mentioned in the review are truly exceptional: larger than Italian pappardelle and you can see them making them on a table in the kitchen. Back soon for more! This restaurant did not meet the expectations at all, all the positive comments made me give it a try but honestly it was disappointing. We went on a friday after calling to reserve a table for two at 8:30pm, as we arrived the atmosphere felt too loud and almost market like. after odering our meal, it came 35 mins late at 9:10pm!!! How does that happen?? i asked the waiter what was taking so long and he said it was due to the many people there, yet when two white customers came after us and sat beside's us, they received their meal within 10mins if not less. Not only that my order which was a lamb noodle came with no lamb whatsoever, it was poor value for money, as i could have got better tasting food at my local chinese take away. if your'e going to have a lamb dish, at least put lamb in the dish instead of four scraps! This is a place i will not return to, the menu is limited and the atmosphere is rather crap, no music just random conversations everywhere. Horrible! another thing which was off putting was when we got our starter( Cold pork) since it was cold we waited for the rest of our hot meal to be served before eating it as it tasted weird cold, every time a waiter went past they would stare at our plate of pork??!! like whats that about? really off putting. reconsider going there if your complexion is anything but white. A nice change from regular Chinese fare but totally overrated. Xinjiang options are nice to see but also quite limited really. The much vaunted lamb skewers are soggy and slimy. Much better in Chinatown's Empress of Sichuan to name just one option. Xinjiang noodles tasty but far too salty. Homestyle aubergine quite good but too oily and, as with everything here, plastered in chopped garlic (though that's how it is in China half the time). Fried dumplings (aka potstickers or guotie) were horrible. Packet ones dumped in a deep fryer and covered in old oil. Not authentic at all. The other dumplings I've had on previous occasions are way better. Service efficient but sullen. Toilets dreadful. This place was good about four years ago but has got so used to serving up 'big bowl chicken' to Guardian readers that they've really got lazy and standards are nothing like what they were. All that said, it can usually be relied on for a good value feed if you're short of options.